Enlarge your business possibilities with Responsive Drupal development services by CSSChopper. We formulate our cutting-edge technical skills with creative ideas to turn your static design into 100% pixel-perfect Drupal themes with fully responsive layouts. For years, we have been engaged in delivering successful Drupal conversion & integration services, which substantiates us to be the victor in the competitive realm. Since inception, we have sustained the aim of delivering the best-in-class services to our clients, which straightaway reflects from our PSD to responsive Drupal theme conversion services. This is why; we merge responsive design approach to our Drupal conversion service to provide state-of-the-art web solutions that improvise our clients’ businesses for seamless growth and profits. For more than five successful years, we have been engaged in delivering high-quality PSD to Drupal conversion service. In these years, we have handled diverse types of intricate projects that substantiate CSSChopper to be a champion in rendering high-quality PSD to HTML/XHTML and Drupal integration services. 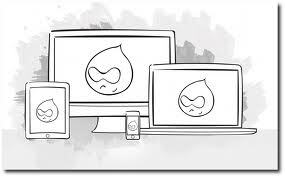 Also, we provide absolute Drupal customization solution at just one place to bring immense convenience to our clients. Accept any design format like PSD, JPEG, JPG, GIF, PNG, TIF, AI, PDF etc. We merge responsive design technology with Drupal to come up with a device-friendly website that runs glibly on your small to big screen sized devices. Our proficient developers and designer work in close coordination with the client to perfectly shape to their custom requirements into rich-functional responsive website powered with Drupal. Why to convert PSD to responsive Drupal theme? One website for numerous devices: A single responsive website is competent to run on multiple devices smoothly whether it is a smartphone, tablet, desktop or laptop. Enhanced user experience: Give your site users sheer satisfactory accessing experience while using your responsive website that automatically responds to the user behavior. Low maintenance: As responsive eliminates the hassles of multiple websites for diverse platforms with just one website; the expenditure involved in maintenance will also be automatically reduced. You may go through our showcased portfolio of responsive web design projects to get familiar with our technical competence and outstanding creativity.